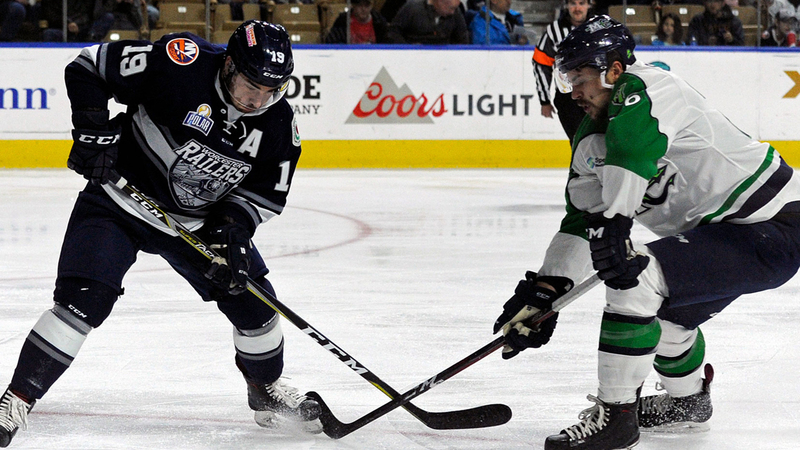 Worcester, MA – The Worcester Railers HC (3-7-1-0, 7pts) dropped their franchise high sixth straight game with a 3-2 overtime loss to the visiting Maine Mariners (4-5-0-1, 9pts) in front of 2,573 fans at the DCU Center on Friday evening. The Railers and Mariners battle again on Saturday with a 6pm start in Portland, ME. Barry Almeida and Dylan Willick scored for Worcester while Evan Buitenhuis made 34 saves in net as the Railers surrendered 1-0 and 2-1 leads before falling in overtime. Brandon Halverson made 30 saves in net for the Mariners in his first win of the season and Shawn St. Amant (1st) scored just 29 seconds into overtime as the Railers dropped to 0-5-1-0 in their last six games. Barry Almeida (3rd) gave the Railers a 1-0 lead in the first period after a nice rush into the offensive zone on a 3-on-2 and shuffled in his own rebound past Brandon Halverson at 12:52 for the only score of the opening frame as Nick Sorkin and Woody Hudson picked up assists. Shots were 13-9 in favor of Maine as Evan Buitenhuis stood tall in net. Maine would tie the score at 1-1 as Terrence Wallin (3rd) as he deflected home a shot from Ryan Culkin at 6:46 of the second period. After great work behind the offensive net by Austin Block, Dylan Willick (2nd) sent a quick shot from the left circle that found the back of the net at 10:15 to give Worcester the 2-1 lead. Maine would tie the score again on their third power play as Alex Kile (7th) zipped a one-timer from the right circle at 12:27 after a nice feed from Dawson Leedhal. The score was tied 2-2 through 40 minutes as Maine held a 30-21 shot advantage. Neither team would score in the third period, but Worcester had several great chances and had a goal disallowed with under two minutes left due to an apparent high stick. Shots were 11-6 in favor of Worcester in the third frame as the two clubs went to overtime tied 2-2. It did not take long for Maine to win the game at Shawn St. Amant (1st) raced down the left wing, cut on top of the crease and snapped a shot past the glove of Buitenhuis at the 29 second mark for the first overtime winner in Mariners franchise history. Notes: Three Stars: 3rd star: Alex Kile (1-0-1) 2nd star: Barry Almeida (1-0-1) 1st star: Shawn St. Armant (GWG)…. Final shots were 37-32 in favor of Maine…. Brandon Halverson (1-3-0-1) made 30 saves on 32 shots for Maine…. Evan Buitenhuis (1-2-1-0) made 34 saves on 37 shots for while Jason San Antonio served as the emergency backup…. Worcester went 0-for-2 on the power play while Maine went 1-for-4…. Tommy Kelley (inj), Yanick Turcotte (inj), Connor Doherty, Tommy Tsicos, Alex Vanier, and Mitch Gillam (inj) did not dress for Worcester…. Jeff Kubiak is currently on recall with the Bridgeport Sound Tigers…. Woody Hudson (1-2-3) now has a three-game point streak with an assist…. Nick Sorkin and Austin Block also added assists for Worcester. Barry Almeida had game high seven shots on net…. Tommy Panico was strong on the blueline with a +2 rating. The Railers and the Mariners do battle again on Saturday night at 6pm from Portland, ME. The Railers return home for a busy four home game in five-day stretch beginning on Wednesday, Nov 14 at 10am vs. the Reading Royals with the second annual School Day Game sponsored by Worcester Telegram and Gazette’s Newspapers in Education program. On Thursday, Nov 15 the Railers host the Thunder at 8pm on College Night presented by Chipotle! The 1st 1,000 fans will receive a BOGO burrito offer from Chipotle and the Railers will host the largest t-shirt toss in Worcester’s pro hockey history in the first intermission – 1 t-shirt will contain $500! College tickets start at just $10! On Saturday, Nov 17 the Railers host the Orlando Solar Bears at 7pm on a BIG GAME SATURDAY with NE Patriot Matthew Slatersigning autographs presented by Energy Monster from 6-8pm! The doors will open at 3pm for the Worcester Blades vs. Montreal Canadiens at 3:30pm. 1 ticket gets you entry into both games starting at just $15! On Sunday, Nov 18 the Railers host the Solar Bears at 3pm on KIDS GIVEAWAY SUNDAY! The first 1,000 kids 12-and-under will receive an orange Railers youth jerseypresented by Energy Monster!